Welcome to the mr web site! The society was founded in 1990 with the purpose of integrating the works of composers persecuted by the Nazi regime into present-day musical culture. To this end, it organizes lecture recitals, in co-operation with the Konzerthaus Berlin and with the radio station Deutschlandfunk. It also organizes musicological conferences, and publishes current research in a journal and in a series of books. 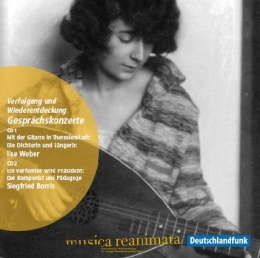 The second issue of our series with recordings of our lecture recitals contains recital No. 101 (Konzerthaus Berlin, 29. 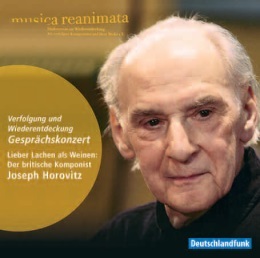 March 2012), featuring the british composer of Austrian Jewish parentage Joseph Horovitz. On the CD, there are his Sonatina for clarinet and piano (1981), the 2nd movement of the Violin Concerto (1951) and the String Quartet No. 5 (1969), performed by Matthias Höfele (clarinet), Tatjana Blome (piano) and Ensemble Zeitlos: Claudia Sack, Philip Douvier, Friedemann Wollheim & Gabriella Strümpel. Also, you can listen to the composer talking with Dr. Albrecht Dümling (in German). Booklet in German and English (24 pages). Price: 15 Euros, shipping fee 4 Euros (2 Euros within Germany, if buying 3 or more sets shipping is free). An ostracised is made president: The composer and educator Siegfried Borris (1906-1987). Performers: Katharina Göres, soprano; Olga Kotchenkova, cello; Hanno Pilz, clarinet; Gottfried Eberle, piano; Albrecht Dümling talks with Juliane Lepsius and Gisela Bauer. Performers: Maria Thomaschke and Andreas Jocksch, singers and speakers; Kathrin Redlich, guitar; Timofey Sattarov, bajan; Volker Suhre, double bass; Winfried Radeke, arrangements, harpsichord and moderator. Price: 20 Euros, shipping fee 4 Euros (2 Euros within Germany, if buying 3 or more sets shipping is free, also in combination with the Horovitz CD).